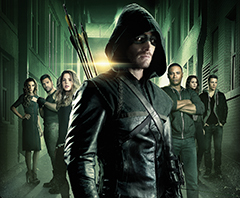 John Mayo, of ComicBookPage, and Kay Kellam, of PopArtsPlace, have a spoiler filled discuss about the second season of Arrow. Before recording we sat down with the BluRay set of Arrow: The Complete Second Season and watched “From Vigilante to Hero” – Documentary highlighting Oliver Queen’s journey from fighting injustices to becoming Sterling City’s accepted savior, which included interviews from actors and behind the scenes producers and creators of the show. This entry was posted in Podcast, Podcasts, Review, Television and tagged A.R.G.U.S., Amanda Waller, Amazo, Anatoly Knyazev, Anthony Ivo, ARGUS, Arrow, Audrey Marie Anderson, Bex Taylor-Klaus, Black Canary, Bronze Tiger, Byron Mann, Caitlin Snow, Caity Lotz, Canary, Cedar Cove, Celina Jade, China White, Colin Donnell, Colton Haynes, ComicBookPage, CW, Cynthia Addai-Robinson, Danielle Panabaker, David Nykl, David Ramsey, DC, DC Entertainment, Deadshoot, Deathstroke, Detective Lance, Dylan Neal, Edward Fyers, Emily Bett Rickards, Felicity Smoak, Flash, Grant Gustin, Huntress, Isabel Rochev, Jamey Sheridan, Jean Loring, Jessica De Gouw, John Barrowman, John Diggle, John Mayo, Katie Cassidy, Katrina Law, Kelly Hu, Laurel Lance, League of Assassins, Lyla MIchaels, Malcolm Merlin, Malcolm Merlyn, Manu Bennett, Michael Jai White, Mockingbird, Moira Queen, Nyssa, Nyssa al Ghul, Oliver Queen, Paul Blackthorne, Podcast, PopArtsPlace, Quentin Lance, Robert Queen, Roy Harper, Sara Lance, Sebastian Blood, Sebastian Dunn, Seth Gabel, Shado, Sin, Slade Wilson, Starling City, Stephen Amell, Suicide Squad, Summer Glau, Susanna Thompson, Teryl Rothery, The Count, Thea Queen, Tommy Merlyn, Willa Holland, Yao Fei on September 26, 2014 by Kay.